2 bedroom - With the addition of a new deck, this penthouse apartment has breath taking views of the harbor and out Islands including Monhegan. The top level of this home has a living room, huge deck, kitchen, gas fireplace, two bedrooms (one double, one king), and bath with shower. There are two beautiful gazebos on the property with magnificent water views of New Harbor. This building is located on the highest elevation of land in New Harbor, commanding sweeping views of the harbor and the landscape. 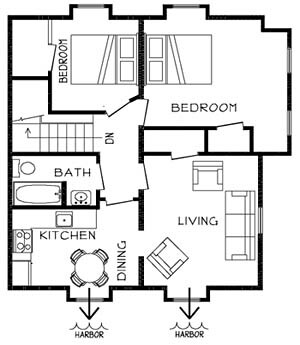 The second floor is 1035 Square Feet of the 3056 Square Feet of the Brackett Home.